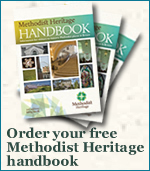 It is the aim of Methodist Heritage that the past should speak to the present to support the modern mission of the Methodist Church. All funds donated will be used in preserving and interpreting our priceless heritage - a vital part of the Methodist Church's Mission in Britain. Church conservation work often struggles to access support, simply because it is inherently linked to the Christian faith. Please give generously.